A nice article on how a suffering comes whether you are just or otherwise. 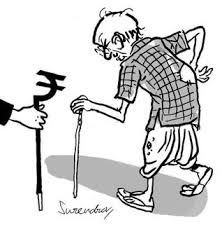 That is what happens with SBI retirees.pity is the live unions overlook a genuine need & allow the neglect to continue.The post if read may change their thinking.my sincere gratitudes for keeping the issue live. So nice that you came out with a meaningful comment on my blog post. I shall love it if you spare a little time to go through my blog posts in general with your scholarly reaction. Hope things are fine at the family level. With love and affection.